Since on Monday we talked about easy--this recipe is the ULTIMATE in easy. Like, it's kind of shocking how quickly you throw this together. This takes no more time than the boxed stuff, and it's a lot more...real. It's not the most amazing, gourmet tasting, macaroni and cheese. But, it's better than the boxed stuff and just as easy. 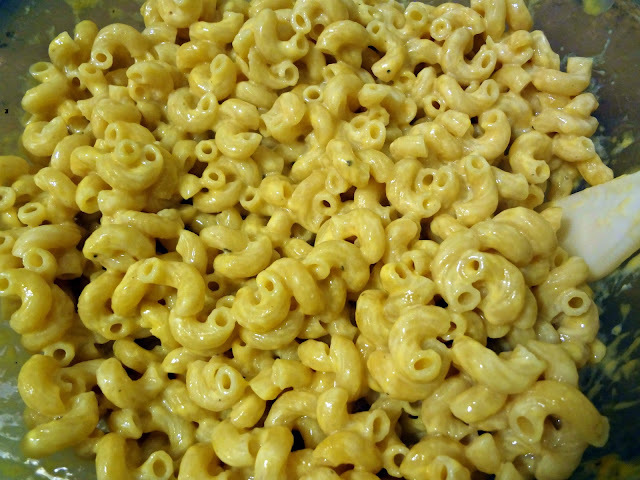 So get yourself some Mac and Cheesey! I'm spending today running around from Penn Station (I get back to NY from Maryland this morning) to home to get ready, then an audition, then recording my Voice Over Demo. I should prob. whip some of this up today, actually. From Picky Palate's "5 Minute Homemade Mac and Cheese"
Place cooked pasta, cheese, and milk in a microwave-safe bowl. Season with S&P to taste. Cover bowl lightly with plastic wrap and microwave on high for 3 minutes. Stir. Microwave an additional 2 minutes. Ur busy girl! Glad you had time for this mac and cheese bc it looks... AWESOME! All these cheesy posts are really making me miss my cheese : ) Have a safe flight!! Oooo I LOVE that idea!! Well when I put the three minute time and this delicious picture together, it certainly equals a winner! Perfect for busy weeknights. I hope you ace the audition! lol #1--that's more for singing. #2--I didn't actually make this today. That is super easy. Most of the time I whip up a roux to make mac and cheese but this being even easier, I'll need to try it. And koodos for more cheesy recipes!